A highly recommended app to have on your Samsung Galaxy Note 3 is Skype. The popular Skype app is used the world over as a free way to make Internet phone calls and to video-chat. Plus, if you’re willing to pony up some money, you can make inexpensive calls to phones around the world. Your Galaxy Note doesn’t come with the Skype app preinstalled. To get Skype, visit the Google Play Store and obtain the Skype app. In case you find multiple apps, get the one that’s from the Skype company itself. To use Skype, you need a Skype account. You can sign up while using the app, or you can visit Skype on a computer to complete the process by using a nice, full-size keyboard and wide-screen monitor. When you start the Skype app for the first time, work through the initial setup screens. You can even take the tour. Be sure to have Skype scour the phone’s address book for contacts you can Skype. This process may take a while, but if you’re just starting out, it’s a great help. Skype is free to use. Text chat is free. 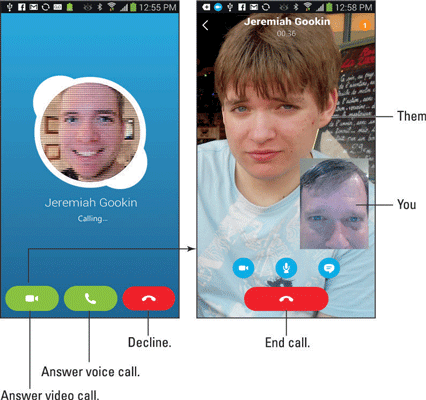 Voice and video chat with one other Skype user are also free. When you want to call a real phone, or video-chat with a group, you need to boost your account with Skype Credit. Text chat with Skype works similarly to texting with the Messenger or Hangouts apps. The difference is that the other person must be a Skype user. Start the Skype app and sign in. You don’t need to sign in when you’ve previously run the Skype app. Like most apps on your phone, Skype continues to run until you sign out or turn off the phone. At the main Skype screen, touch the People tab and choose a contact. Or you can choose one of the contact icons shown on the main screen. Type your text in the text box. The box is found at the bottom of the screen. It says Type a Message Here. Touch the blue arrow icon to send the message. As long as your Skype friend is online and eager, you’ll be chatting in no time. At the far right end of the text box, you find the Smiley icon. Use this icon to insert a cute graphic into your text. The Skype Chat notification appears whenever someone wants to chat with you. It’s handy to see, especially when you may have switched away from the Skype app to use another app. Choose that notification to get into the conversation. To stop chatting, touch the Back icon. The conversation is retained in the Skype app, even after the other person has disconnected. For the chat to work, the other user must be logged in on Skype and available to chat. Placing a video call with Skype is easy: Start up a text chat as described earlier. After the conversation starts, touch the Video Call icon. The call rings through to the contact, and if they want to video-chat, they pick up in no time and you’re talking and looking at each other. When someone calls you on Skype, you see the Skype incoming-call screen. Touch the Answer Voice Call icon to answer as a voice-only call; touch the Answer Video Call icon (if it’s available) to answer using video. Touch Decline to dismiss the call, especially when it’s someone who annoys you. Touch the red End Call button to end the call. Voice and video chat on Skype over the Internet are free. When you use a Wi-Fi connection, you can chat without incurring a loss of your cellular plan’s data minutes. You can chat with any user in your Skype contacts list by using a mobile device, a computer, or any other gizmo on which Skype is installed.